While last year Arlington County Fair visitors could freely recognize Westmoreland's excellence, this year all the competitive exhibition tags included just a number. I asked a Fair Official why the exhibit tags didn't include the exhibitors' names. She said that some persons were worried about having children's names on exhibition tags for exhibits that children entered. So they eliminated names from all the tags. Many children enjoy frightening and probably slightly risky rides at the Fair. The risk associated with many rides at the Fair is surely greater than the risk of somebody seeing a name on an exhibition tag and that name turning out to be a child's name. The risk of harm from a traffic accident while driving to the Fair is probably orders of magnitude larger than the risk of harm from having someone see a name on an exhibition ticket, where that name turns out to be a child's name. Encouraging children to be unreasonably fearful of their neighbors is bad for children. Perhaps Arlington County was just trying to help the mental health of horror-obsessed parents. While I think that horror-obsessed parents should try not to pass their fears on to their children, I have enough compassion for those parents to accept not having children's names on exhibit tags. But also eliminating adults' names is completely absurd. It makes the idea of Arlington community a farce. Suppose Chul is having a problem with vampires in his attic. His neighbor Linda says, "Chul, remember Ijahman? He spoke to the civic association several years ago about growing herbs. I haven't seen him for ages since he moved to his new place in Ballston. 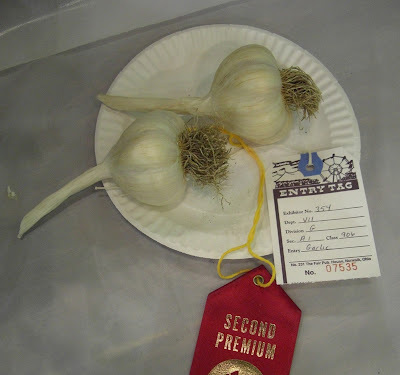 But when I was at the Arlington County Fair today, I noticed -- his garlic won the Second Premium Prize! Why don't you look him up and ask him for some fresh, strong garlic?" Thanks to the new paranoia in Arlington, this sort of neighborly conversation can't happen any longer. Whose garlic won Second Premium Prize? Why, it's Exhibitor No. 354! I can't wait to tell that to my neighbors! Isn't No. 354 quite a gardener? A beacon of inspiring humanity amidst this administrative depersonalization was No. 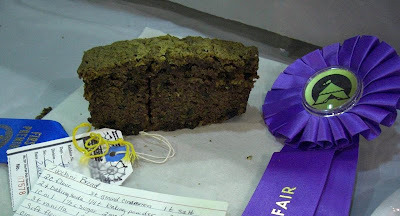 890, the First Premium Prize Winner and Fair Champion for zucchini bread. No. 890 attached to its entry the complete recipe for its zucchini bread. What a great spirit of sharing! No. 890 obviously was not afraid that its neighbors would try to copy and make for themselves its award-winning zucchini bread. I think No. 890, whoever you are, deserves to win again next year.